Fathers Day sermons can be very effective in challenging and encouraging men to be the leaders and examples that God intended. I don't know about the entire world, but I can certainly say for certain that in the United States and Australia there is such a lack of male leadership in the home, in the workplace, and in the government. I'm not sure if it's just the fact that men have been worn down by all the women's rights movement, or if it's inevitable as part of the curse of man's disobedience as in Isaiah 3:12, "As for my people, children are their oppressors, and women rule over them. O my people, they which lead thee cause thee to err, and destroy the way of thy paths." The role that God designed for the husband and father is a sacred one and regardless of all generational circumstances, one that holds tremendous responsibility and accountability. Don's preached plenty of Fathers Day messages over the years, and once again he has allowed me to pick out a few to make them available to those who might be looking for Baptist sermons for Father's Day. 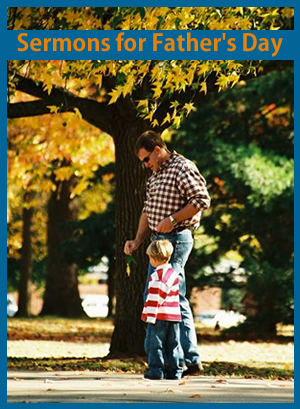 You can use these Fathers Day sermon outlines as they are, or pick out some of the Scriptures and thoughts to develop your own message for Father's Day as the Holy Spirit leads and directs you. Each of these links will open into a new window as a pdf file that you can print or download for your use. 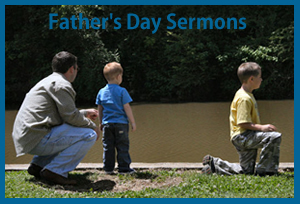 These sermon outlines for Father's Day are completely free to you. We hope they will be a blessing to you and those you serve. There is absolutely no obligation, but if you would like to make a small donation to help support our mission work, you can use the Paypal button to the right. Every dollar helps and is much appreciated.